lower left in graphite: M.C. 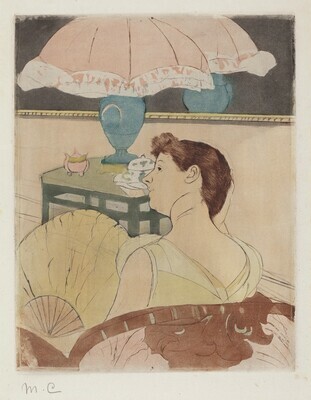 Prints and Drawings by Mary Cassatt, National Gallery of Art, Washington, 1963. Mary Cassatt, 1844-1926, Newport Harbour Art Museum, RI; Santa Barbara Museum, CA, 1973-1974. Mary Cassatt: The Color Prints, National Gallery of Art, Washington; Museum of Fine Arts, Boston; Williams College Museum of Art, Williamstown, 1989-1990. Breeskin, Adelyn Dohme. Mary Cassatt: A Catalogue Raisonné of the Graphic Work. Washington, DC: Smithsonian Institution Press, 1979, no. 144, iii/iii. Mathews, Nancy Mowll, and Barbara Stern Shapiro. Mary Cassatt: The Color Prints. New York: Harry N. Abrams, 1989, no. 6, iii/iv.